Opened since 2008, Infinity at Brickell is a 52-story skyscraper that is known to be the seventh tallest building in Miami as well as Florida. With commercial space situated on the second through 11th floors, residential property begins at the 12th and climbs to the top of the building. The unique design of the sky lofts and sky flats draws Miami residents while the two-story lobby exudes the elegance and luxury expected in Brickell condominium. 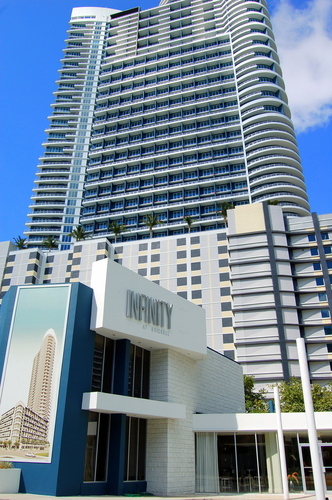 Infinity at Brickell is truly an architectural masterpiece that is something to see. 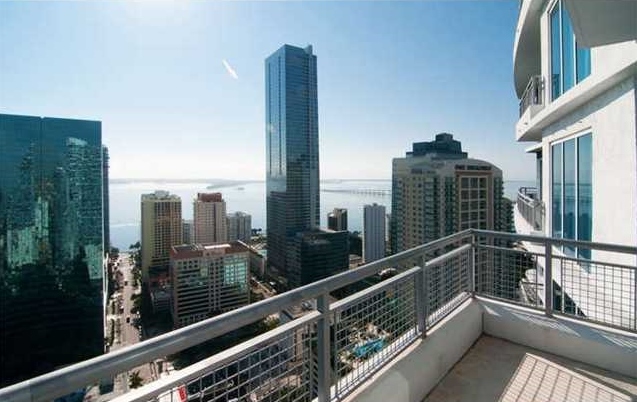 Infinity at Brickell is located at 60 West 13th Street just off Miami Avenue. 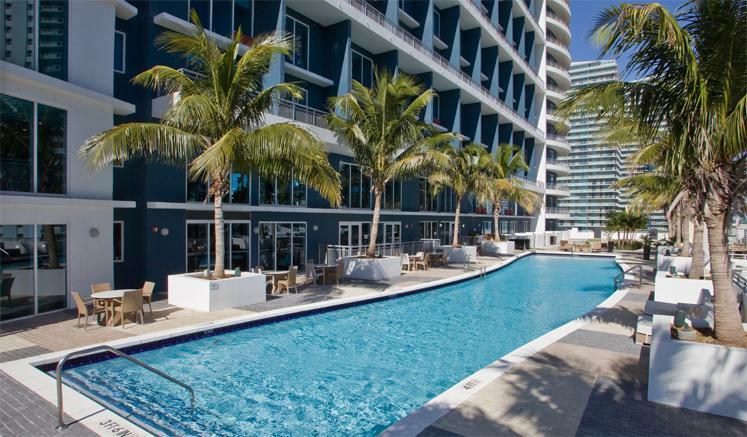 It is perfectly situated within walking distance to Brickell Village, shopping and dining. Additionally, the beaches, Design District and other popular areas of Miami-Dade are a short drive away. The major transportation hubs are within 15 miles of Infinity Brickell with the major arteries into and out of Miami surrounding the condominium. Infinity at Brickell offers some of the best amenities in Miami. Residents are always found at the pool or in the pool lounge area where there are games, a bar area and tons of room for entertaining. Additionally, there is a full service, state of the art, fully-equipped fitness center with group classes and individual training as well as locker rooms, sauna and steam rooms. All residents also enjoy 24-hour concierge and doorman services as well as security and valet parking, and air conditioned storage lockers. For penthouse residences located between the 40th and 52nd floors, there is private access to Club Infinity where the residents have exclusive use of a private roof top area with a splash pool, beautiful tropical landscaping, a whirlpool spa, and gazebo for entertaining. Residential units are available with a combination of one, two, and three-bedroom Sky-Lofts. Sky-Lofts offer condominium living from a different viewpoint. The new design is a take on typical lofts where more room space is created by doing away with hallways and transitional areas. Each residence is open and has high ceilings -- 10-20 feet depending on whether they are lofts or flats. Another unique feature is that each residence showcases the Florida sunshine and tropical atmosphere via floor to ceiling windows (or walls of windows as they are called). Additionally, residents can relax on private wrap-around terraces that showcase panoramic city and water views. Inside, highlights include large bedrooms with walk-in closets and baths with marble vanities, shower walls and floors. Throughout each residence, there are designer fixtures and finishes. The kitchen features Italian cabinetry, high-end appliances and granite counter tops. Infinity at Brickell real estate features list prices that vary with studios starting in the mid-$200s; one-bedroom sky flats in the upper-$200s; two-bedrooms in the upper-$400s and three bedrooms in the mid-$600s. Two-story penthouse sky lofts climb to over $1 million. Since the start of the year, six (6)- one-bedrooms have sold with sale prices between the upper-$200s and low-$300s while four (4)- two bedrooms’ sale prices ranged from mid-$400s to mid-$500s. One upper-level three-bedroom penthouse sold for just over $1 million. 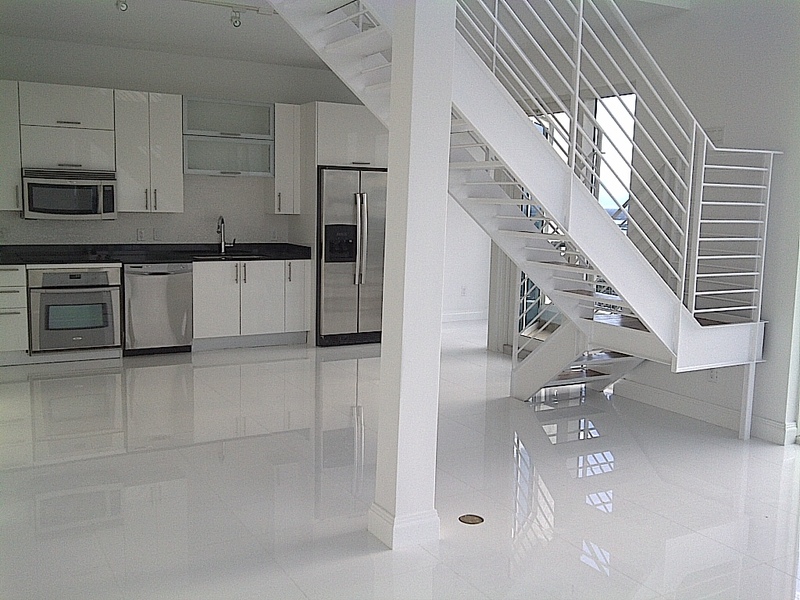 Real estate investors also find great interest in real estate here as Infinity at Brickell rentals are very popular. Studios generate a monthly rental rate between $1,500 and $1,600 while one-bedrooms fall between $1,750 and $2,350 and two and three bedrooms range from $2,600 to almost $5,000. Infinity features well-sought after Brickell real estate for many Miami residents from first time buyers to those seeking the ultimate in luxury penthouse living. The location combined with the design in each residence and the community amenities make this the pinnacle of Brickell living.